This is the most unexpected sight to see on a suburban street in Solihull. Its architect, the young John Soane, soon to design the most elaborate country houses, such as Wimpole Hall in Cambridgeshire and Tyringham Hall in Buckinghamshire, described it as a barn à la Paestum. While Soane’s houses are elegant Georgian or Regency buildings with complex interiors often displaying a sense of space that’s both intricate and dazzlingly sophisticated, this barn is designed in the simplest, plainest red-brick classicism. The building dates to the early phase of the architect’s career. He had studied at the Royal Academy and in 1777 won the Academy’s most glittering prize: its Travelling Scholarship. This enabled him to go to Italy to study the buildings of Rome. While there he also traveled south to visit Caserta, Baia, and Pompeii. One of the highlights of this trip was Paestum, the Greco-Roman city some 50 miles southeast of Naples, where the ruins of three ancient Doric temples, built by Greek colonists, survive. These temples, dating from the 5th and 6th centuries BC, are among some of the best preserved of all ancient Greek buildings. Their antiquity and their proportions inspired Soane. While in Italy Soane met a number of British aristocrats and gentry whom he saw as prospective clients. Among them were several young men who hired Soane as a draughtsman to travel with them from Italy to Sicily and Malta. One member of this group was Henry Greswold Lewis, a landowner from Solihull, and it was for Lewis in 1798 that Soane designed this unlikely structure as a kind of homage to the ruins he had seen at Peastum. The building is severe, and rather shocking. It’s not exactly like a Greek temple, which would have evenly spaced columns, a deeper entablature above the columns, and no round arch in the centre. 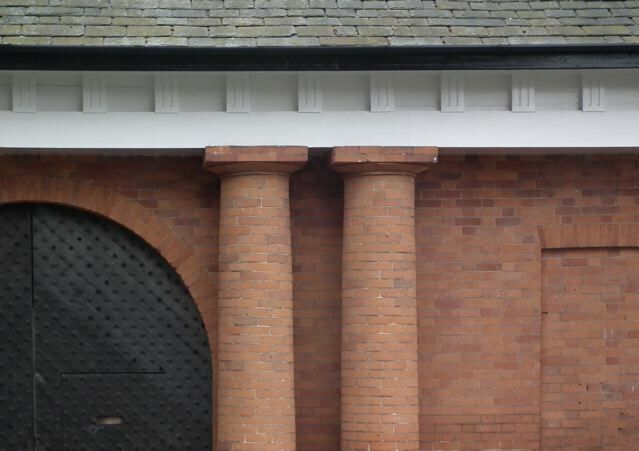 But its carefully laid soft red bricks and imperfect white entablature do the job of suggesting ancient Greece and translating some of its architectural hallmarks into the very English medium of brick. For all its severity, it must have made Lewis think of his youthful travels, and smile. How interesting...I've never heard of or seen this building before. It's kind of oddly beautiful. Is is used as a barn? Desingers Muse: Thanks for your comment. It does have a stark beauty, I agree. I've read that it's used as 'private accommodation', but it was impossible to see the building from the other side, so I don't know how that works. No windows are visible from the road. The barn was certainly designed in the simplest, plainest and most ordinary red-brick classicism. Sometimes I read papers that I wrote at 25 and shudder. The bricks appear as brand-new. Do you think they have been cleaned or are they just pollution free? Although not strictly obedient to Classical rules it does have it's own degree of elegance. Hels: I must check what else he'd designed by this point – I'm sure he'd already produced some quite sophisticated buildings, and he probably was aiming at a deliberate simplicity here. Bazza: I'm not sure. There's not must industry round there, so the bricks may never have needed cleaning. The gatehouse is used now as office space. I live a minutes' walk from there. The near contiguous Bruton and Malvern Parks form what was the Greswolde estate. Soane also worked on Malvern Hall on Bruton Avenue, which was the centrepiece of the estate. It was also, notably, painted several times by the young Constable. Of the building itself: it really is a little curio, not quite a folly on account of its functional value, but certainly a piece of playful and delightful estate scenery; and owing as much to contemporary French Classicism in its brawny Doric look, as to the Paestum ruins, cf. work of Ledoux. The dating of 1798 to the barn puts it more towards Soane's early maturity, as it follows his work at Tyringham by five years. Nevertheless it is curious as an early piece of Doric design, two decades before the popularity of the Greek style. In this quality it forms a group with other early Greek work focused in the West Midlands: Stuart's Temple at Hagley of the 1750s; Bonomi's Great Packington Church of 1790; and the county gaol at Warwick of 1783. Matthew: Thanks you, that's really interesting information. The group of early West Midlands Doric buildings are very different, aren't they, in their interpretation of the order. 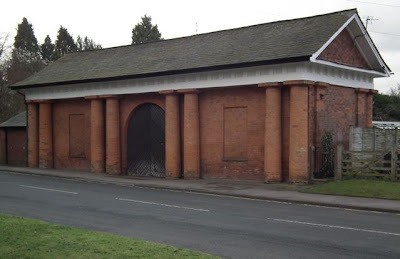 For example the Hagley temple and Great Packington both with fluted columns (the latter with a pronounced variation in diameter), the Soane building and (I think) the Warwick gaol unfluted. I'll have to go round all these buildings again to compare them!